Published by Sareth Ney on April 1, 2015 at 6:14 a.m.
TAMPA, Fla.—Sunset Music Festival will be on the rise at Raymond James Stadium, on May 23 and 24. Disco Donnie and Sunset Events have brought together some of the biggest names in electronic dance music for the Memorial Day weekend event. A total number of 50 acts will be performing on three stages. Tiësto and Skrillex are set to co-headline, on May 23. The direct supports are Flosstradamus, Porter Robinson and Showtek. Porter Robinson will be performing a live set. The lineup for May 23 includes: Andrew Rayel, Audien, Cashmere Cat, Cedric Gevais, The Chainsmokers, Don Diablo, Duke Dumont, Headhunterz, Keys N Krates, Noisecontrollers, Oliver Heldens, Robin Schulz, Sub Focus, Tchami, Thomas Jack and TJR. Armin Van Buuren will close out the festival, on May 24. On the bill with him will be: Arctic Moon, Astrix, Bixel Boys, Botnek, Claptone, Destructo, Duelle, Ferry Tayle, Hunter Siegel, Jordan Suckley, Kove, Mako, Mark Sixma, Marlo, Meaux Green, Mija, Morten, Moti, Peking Duk, Route 94, Sam Feldt, Slander, Snbrn, Solarstone, Trippy Turtle and Viceroy. For the first time of Sunset Music Festival, there will be a cashless system. Those attending the event will be able to purchase refreshments, food and merchandise with the event’s wristbands. Plus, it will give attendees the ability to share status updates via RFID technology. Early bird tickets are on sale. The two-day general admission tickets are starting at $149 and two-day very important person (VIP) tickets are starting at $219. Both options can be purchased by clicking here. Festival information including ticket and travel information can be accessed by clicking here. Sunset Music Festival encourages concertgoers to make early arrangements, due to increase in prices as the festival nears. The event is 18+ and will start at 2 p.m. and last until midnight, on both days. 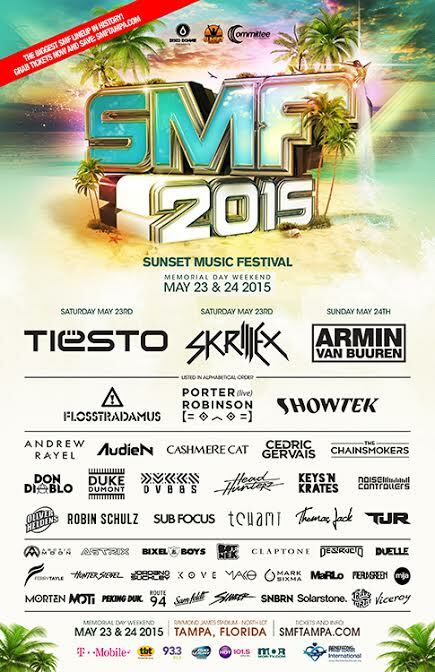 To visit Sunset Music Festival’s website, please click here. To “Like” them on facebook, please click here. To follow them on twitter, please click here. To follow them on Instagram, please click here. To visit Disco Donnie Presents website, please click here. To “Like” them on facebook, please click here. To follow them on twitter, please click here. To follow them on Instagram, please click here. To visit Sunset Tampa’s website, please click here. To “Like” them on facebook, please click here. To follow them on twitter, please click here. To follow them on Instagram, please click here.